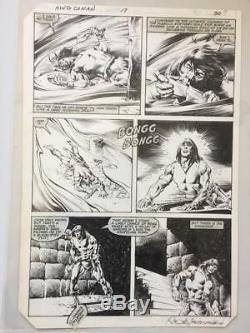 John Buscema/Rudy Nebres original comic book art page -King Conan Issue 17 Pg 30. The item "John Buscema/Rudy Nebres original comic book art page -King Conan Issue 17 Pg 30" is in sale since Saturday, January 06, 2018. This item is in the category "Collectibles\Comics\Original Comic Art\Interior Pages". The seller is "itconnectionnyc09" and is located in Astoria, New York. This item can be shipped to United States, Canada, United Kingdom, Denmark, Romania, Slovakia, Bulgaria, Czech republic, Finland, Hungary, Latvia, Lithuania, Malta, Estonia, Australia, Greece, Portugal, Cyprus, Slovenia, Japan, China, Sweden, South Korea, Indonesia, Taiwan, South africa, Thailand, Belgium, France, Hong Kong, Ireland, Netherlands, Poland, Spain, Italy, Germany, Austria, Russian federation, Israel, Mexico, New Zealand, Singapore, Switzerland, Norway, Saudi arabia, Ukraine, United arab emirates, Qatar, Kuwait, Bahrain, Croatia, Malaysia, Brazil, Chile, Colombia, Costa rica, Panama, Trinidad and tobago, Guatemala, El salvador, Honduras, Jamaica.